It can be broken into two categories: catabolism and anabolism. Cellular respiration, for example, is a catabolic process as it breaks down substances. Building up nucleic acids and proteins, on the other hand, is anabolic. 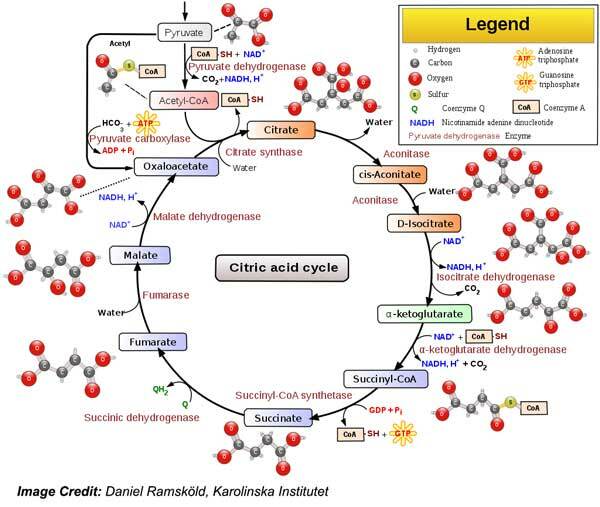 The citric acid cycle (pictured), also known as the Krebs cycle, is a crucial metabolic pathway that links fat, carbohydrate, and protein metabolism. Investigating metabolic pathways is important in epigenetic research to help understand diseases such as cancer and cardiovascular disorders, as well as metabolic disorders including diabetes, phenylketonuria, and hyperthyroidism. Glucose metabolism antibodies are useful for investigating enzymes involved in metabolic pathways including glycolysis and gluconeogenesis, as well as proteins involved in the synthesis of glycosylated proteins and glycolipids. For example, unregulated glucose levels may lead to diabetes, therefore antibodies related to glucose metabolism can be useful for investigating this prolific disease. Various targets and proteins related to glycolysis include Glyceraldehyde 3-phosphate dehydrogenase (GAPDH), hexokinases such as Hexokinase 1 (HK1) and Hexokinase Domain Containing 1 (HKDC1), as well as pyruvate kinases such as PKM1 and PKM2, among many others. Lipid metabolism antibodies may be used by epigenetic researchers investigating the synthesis of lipids from acetyl-CoA, known as lipogenesis, and the breakdown of lipids to produce energy, called lipolysis. For instance, research has connected lipid metabolism and histone methylation with changes in lifespan. Lipid metabolism has also been linked to developmental epigenetic programming, potentially impacting long-term health and disease risk. 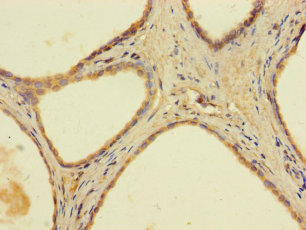 Popular targets connected to lipid metabolism include Apolipoprotein E (ApoE) and Scavenger Receptor Class B Member 1 (SCARB1). 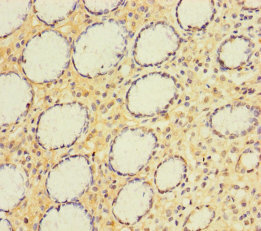 Protein metabolism antibodies can help researchers study the synthesis of amino acids and proteins as well as the breakdown of proteins. For example, the maternal diet during pregnancy and nutritional epigenetics are topics of interest to epigenetic researchers, especially since amino acids are known to play key roles in providing methyl donors for DNA and protein methylation. Additionally, research suggests that maternal dietary protein restriction may affect covalent modifications of the fetal genome. Amino acids and related metabolic pathways are particularly involved in conditions such as metabolic syndrome and, combined with epigenetic insights, may offer new avenues for treatment such as dietary intervention. Lipid metabolism involves the synthesis of lipids, or lipogenesis, and lipid breakdown or degradation, lipolysis, by fatty acid oxidation to produce energy. 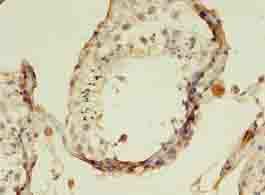 Lipids are obtained from dietary sources or synthesized from carbohydrate precursors. Lipid metabolism is also associated with glucose metabolism, as some products of glucose, such as acetyl-CoA, can be converted into lipids. During lipid catabolism, triglycerides are broken down into fatty acids and glycerol. The fatty acids are further broken down by fatty acid oxidation, or beta-oxidation into Acetyl-CoA, which can enter the citric acid cycle for energy; while glycerol enters glycolysis as dihydroxyacetone phosphate (DHAP). Triglycerides yield more energy by mass than glucose, and are an important source of energy. Excess acetyl-CoA from the oxidation of fatty acids, can be converted into ketone bodies by the ketogenesis pathway, which can provide energy when glucose levels are low. Ketone bodies can be used as source of energy in the brain which is mostly dependent on glucose. Excess ketone bodies produced can be broken down into CO2 and acetone, and can lead to diabetic ketoacidosis, a serious condition in diabetics. Protein metabolism involves the synthesis of amino acids and proteins and the breakdown of proteins. Dietary proteins are an essential source of amino acids necessary for protein synthesis, as the body is not able to synthesize all twenty amino acids. The breakdown of dietary proteins into amino acids begins in the stomach with the secretion of pepsin and hydrochloric acid, which promote protein denaturation and breakdown into smaller polypeptides and individual amino acids. Other enzymes secreted by the pancreas, like trypsin and chymotrypsin also participate in protein breakdown. The amino acids can then be transported into cells, and used to synthesize protein, or can be further broken down to remove the amino group by deamination. During deamination, the amino group gets broken down into ammonia, which is excreted, and the carbon skeleton, which has several fates. The carbon skeleton of the ketogenic amino acids produce acetyl-CoA and other derivatives, which can enter the citric acid cycle, or produce fatty acids; while the glucogenic amino acids produce pyruvate and other carbon intermediates which can be converted to glucose, or converted to fatty acids or glycogen for storage. Purine and pyrimidine nucleotides are the subunits of nucleic acids, DNA and RNA, and are the precursors of nucleotide cofactors, such as NAD. Nucleotide metabolism involves the synthesis and degradation of nucleotides, which are formed from a phosphate, pentose sugar (ribose or 2-deoxyribose), and a nitrogenous base (a purine or pyrimidine). Two major pathways are involved in the synthesis of nucleotides, the de novo pathway and the salvage pathway. Nucleotides are synthesized by the de novo pathway using amino acids, CO2, and tetrahydrofolate. The salvage pathway interconverts nucleosides and nucleotides and recycles purine and pyrimidine bases released as by-products from the breakdown of nucleotides and cofactors during cellular metabolism. The salvage pathway uses a smaller amount of energy than the de novo synthesis pathway.